City of Krakow can boast numerous squares that provide a wealth of quality public spaces. The Old Town's famous Rynek Glowny immense central plaza, lined with sidewalk cafes and historic buildings, is a must for every tourist. Also other squares – notably Maly Rynek, Plac Szczepanski, and Plac Nowy – are popular venues for open-air shows and other events. Some old piazzas, such as Plac Marii Magdaleny and Plac Mariacki, enchant with their spectacular scenery. Some, e.g. Plac Matejki or Plac Sw. Ducha, provide fine vistas of the nearby monuments. At the same time a number of squares in Krakow, including Rynek Kleparski next to the Old Town historic district, have retained the traditional role as popular marketplaces. The most notable squares in Krakow. Grand Square (Rynek Glowny, often wrongly translated as 'Market Square'), has been Krakow’s hub ever since the city’s Old Town historic district got the present grid of streets in the 13th century. The huge 10-acre square, the largest of all Europe’s medieval cities, is a curio in itself. Its chief landmarks are the Renaissance 16th-century Cloth Hall in the center (now home to the museum of the 19th-century art upstairs and numerous ground-floor stalls with souvenirs), the Gothic 13th-century Town Hall Tower, and the grand Gothic 14th-century basilica of the Virgin Mary’s. Yet practically each of 47 buildings at the square boasts a considerable historical and/or architectural value. Plac Szczepanski square, just one block west from Krakow’s huge central Grand Square, appeared in the city’s medieval street grid in the early 19th century when a 13th-century church and the adjacent buildings were demolished. Edifice at its corner with the Jagiellonska Street dates back to 1798 and is the oldest theater house in this country. In 1907 it was given a modernist facelift and now shelters the Teatr Stary theater, reputed Poland’s best company of players. 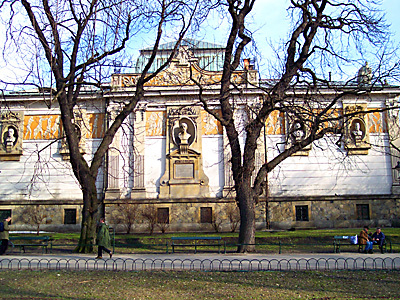 The Palace of Art (Palac Sztuki), a monumental modernist temple to the cult of fine arts, which took up the square’s western side in 1900, remains one of the city’s most prestigious venues for temporary exhibitions. Since 1964 it has got a rival exhibition hall in the bunker-like structure just across the street where mostly the latest art is shown nowadays. After a refurbishment the Plac Szczepanski square has got a stylish appearance in 2010. Its most spectacular feature is a computerized fountain performing the light-sound-and-water show in front of the Palace of Art. Maly Rynek Square, situated one block east from the huge central Grand Square in Krakow’s medieval compact grid of streets, ranks among the city’s most scenic places. For centuries this rectangle served as the meat market – crucial function in the medieval economy. The eastern side of the Maly Rynek Sq. is lined by picturesque houses of burghers. They face an array of church buildings across the square, at the foot of the towering chancel of the basilica of the Virgin Mary’s with its famous 14th-century stained-glass widows. Ulica Szeroka Square is so long and narrow that it is officially called a street (Polish ‘ulica’). It once served both as a marketplace and a forum of Kazimierz’s Jewish Town, the capital in everything but name of Poland’s Jews from the 16th century through the 19th century. At the square’s northern end one finds the 16th-century mansion of Polish noblemen, The Jordans, which has undergone several major revamps in the ensuing centuries. The opposite end of the square, where king Jan I Olbracht settled Jews from Krakow in 1495, is taken up by the grand Renaissance Old Synagogue of 1570, now the Museum of Judaism. It adjoins remnants of the 14th-century Kazimierz’s city walls. 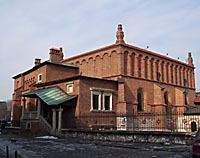 The 16th-century modest R’emuh Synagogue at 40 Szeroka Street is placed next to the R’emuh burial ground; and the 17th-century Baroque building of the former Popper Synagogue still stands at 16 Szeroka Street.